Aberdeen is located in North East Scotland and is the country's third largest city. It is an ancient settlement and people have lived in the area for over 8000 years. Around 220,000 people now inhabit Aberdeen and enjoy its dramatic granite architecture that glistens on the many sunny days (Aberdeen has more sunshine than Birmingham and almost as much as London). In mid to late June it never gets really dark, with the sun setting after ten pm and rising at around 4am. Golf is played until 11pm by many. The city is set between the Rivers Dee and Don, both of which provide for wonderful walks and scenery. The modern name Aberdeen literally means between the Dee and Don. 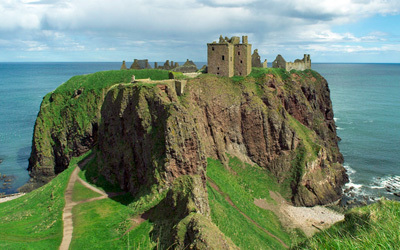 On the coast, Aberdeen has a long, spectacular walk on a beach between the two rivers which turns into high sand dunes north of the Don stretching as far as Fraserburgh; to the south of the Dee are steep rocky cliff faces and deep inlets making for spectacular scenery and good rock-climbing. It is one of Britain’s most spectacular coasts. The earliest charter for the city was granted by William the Lion in 1179. In 1319, the Great Charter of Robert the Bruce transformed Aberdeen into a property-owning and financially independent community and formed the basis for the city's Common Good Fund which still benefits Aberdonians. History oozes from the buildings. Traditionally, Aberdeen was home to fishing, textile mills, shipbuilding and paper making. These industries have been largely replaced but their impact on the city is still obvious. In modern times, Aberdeen has driven the north east to the very top of the UK’s economic growth tables with high technology developments in the electronics design and development industry, food, life sciences and, obviously, the oil industry, powering an economic boom. Aberdeen has won Britain in Bloom more than any other city, has Britain’s oldest business, the harbour, which is one of the UK’s busiest, the oldest city archive, fabulous parks, dolphins, boutique hotels and trendy bars. With 30 golf courses within 30 minutes of the city, the whisky and castle trails and fabulous walking and nature all around, Aberdeen is a perfect weekend city break venue. To find out more information on the area visit www.visitaberdeen.com.